Taco trucks offer authentic, cheap and delicious food, yet fear of the unknown sends most of us straight to Taco Hell. Follow this simple guide and you'll be running out for more salsa verde instead of running for the border. I spent a weekend braving a variety of taco eateries with my pals and a pair of massive Ram 2500HD trucks, sampling everything from tamarind juice to deep fried brains, in order to bring you this instructive text. Click through the thumbs for a step-by-step guide or click here to see the whole enchilada. The difference between a great taco truck and a crappy one isn't discernible through typical means. The oldest, shadiest trailer may hide the best tacos. When setting out to sample the mobile fare your best hint is a long line. Diarrhea isn't a cultural thing; if the food makes people sick they're probably not going back. If you're really lucky, you can find someone in the know to act as a guide. In my case, firearm enthusiast and fearless foodie Jay Roscoe of Guns and Tacos served as a curator. If you're not lucky, look around the Internet for Yelp! or other reviews. Note: these are taco trucks so they may move around from day to day. Anyone who sells food with average transactions below five bucks is in a volume business, and you standing there like a gabacho hemming-and-hawing over what kind of tortilla you want is going to slow down the process. Most taco trucks have gigantic signs on the side showing the types of meats they offer and the prices. Make your selection before you get to the window. al Pastor - almost always pork, cooked like shawarma on a spit called a trompo with a chile sauce. If you're not sure what's good you can always ask someone around you. At Houston's Tacomadre our crew had no less than world-famous rapper Chingo Bling offer up suggestions. He said the fajitas were the best and the salsa verde "is made with an hallucinogenic compound" and ordered us two plate-loads full. No joke, the stuff was like crack. 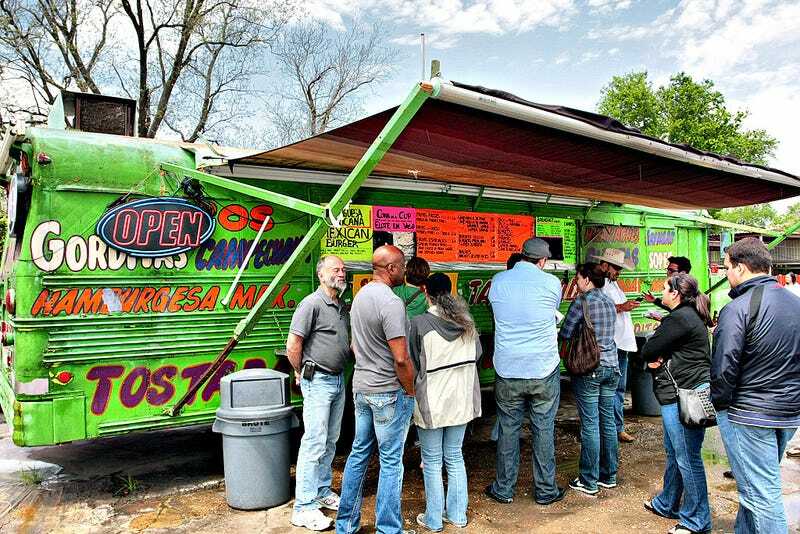 He also said this particular brand of taqueria is the "Capitol Records of taco trucks." Para Aqui (Parah Key) "For here"
Para Llevar (Parah Yeh Vahr) "To go"
Cuantas? (Quant-Toss) – How much? Note: There's no need to understand their response. Just pretend like you understood, give them a ten and let them do the math. Con todo (Cone Toad-O) "With everything". Maiz (Mai's) "Corn", as in corn tortillas. Harina (Harina) "Flour", as in flour tortillas. Servilleta (Sir Vee Yay Tah) "Napkin"
Soda naranja (Sodah Naran-Ha) "Orange Soda"
Salsa Roja – "Red Salsa"
Salsa Verde – "Green Salsa"
Cual es su especialidad? – "What's your specialty"? Note: The word "caliente" is often misunderstood as meaning, "spicy." "Picoso" is the correct word for spicy. Caliente means hot, as in "your mom is hot." Crazy hot. Pulling out a credit card at most taco trucks is a good way to get a laugh (or a less desirable response). This is almost always a cash business and the smaller bills the better. The good thing is tacos are super cheap so you can probably get by just handing them a few squished Jorge Washingtons. Unless it's a slow day expect to wait at least a couple of minutes for your taco. The food is made-to-order and it's quicker to take an order than it is to fulfill one. Chill. It's probably worth the wait. There's also no guarantee the food is going to come out chronologically so keep your receipt if there's a number on it or listen carefully for the food you ordered. Just because you order it para aqui doesn't mean you'll have a nice place to sit. If there's a table with chairs that's fine, but often you'll end up sitting on the street. Hanging around in front of a taco stand to eat is kosher, even if the carnitas are not. Chrysler was kind enough to loan moi and Zerin from Speed:Sport:Life a pair of giant Ram 2500HD trucks, Lone Star and Laramie editions, respectively. Drop the tailgate and setup shop, assuming it's a safe neighborhood. Mexican food can be spicy, but in a day where I ingested more than a dozen tacos nothing I had was particularly tongue-numbing. The biggest shock was when one of the two frijoles tacos I ordered was delivered with sesos inside. I don't typically eat brains but hey, when in Rome - or, when in a flea market as was the case. Still, it was nice to have some sweet Agua de tamarindo/tamarind juice around to wash it down with. This is meant to be a general overview of the great world of taco trucks and your experience may vary based on where you live. Do you have anything to add? Can you recommend any great taco trucks? Let us know in the comments below. In the meantime, enjoy Chingo Bling's "Taco Shop" video.